Three young and promising footballers of Bhergaon sub division in Udalguri district has been selected for Assam state under-17 team to represent the state in the National Junior Football Championship scheduled to be held from November 18 to December 1 at Rajkot in Gujarat. 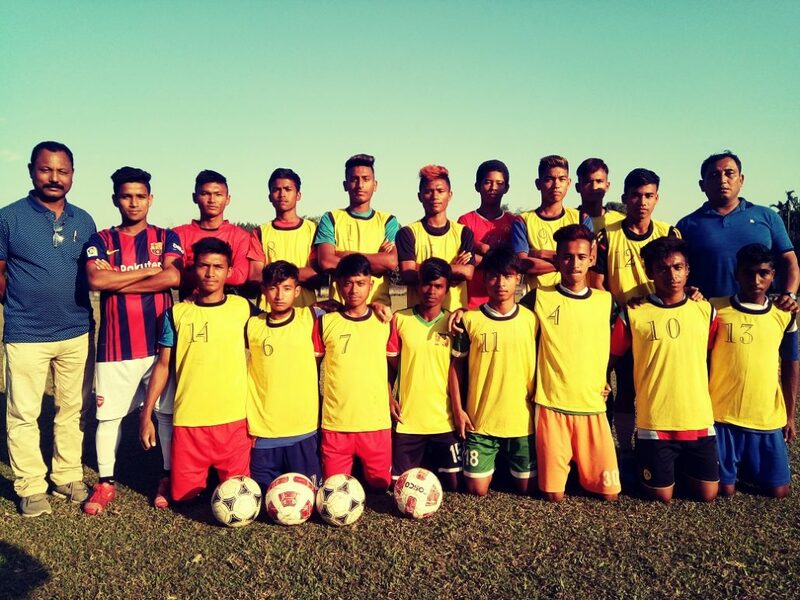 The selection camp for the state team was organized at Dimakuchi in Bhergaon sub division from October 25 and the list of the selected footballers was finalized on November 7 last. A total of 45 young footballers from different districts of the State were invited for the selection camp and the state team has been formed with a total of twenty players. The selected players from Bhergaon are namely Sanjwrang Basumatary (goalkeeper), Milan Boro (defence) and Naba Basumatary (half). The other selected players are namely goalkeeper Birkhang Daimary (Kokrajhar), Benjamin Tanti (Dibrugarh), Jogen Mech (Nazira), Akram Raja Ali (Tinisukia), Sumit Marak (Silchar), Nikhil Mili (Sibasagar), Lanu Toshilongchar (Jorhat), Rohan Brahma (Kokrajhar), Siddhanta Chetia (Moran), Sansungma Brahma (Gossaigaon), Sourabh Saikia (Sivasagar), Sushanta Narzary (Kokrajhar), Skar Khalko (Lakhimpur), Dinar Narzary (Gossaigaon), Bedanta Gogoi (Tinisukia), Gothal Wary (Gossaigaon) and Vishal Narzary (Chirang). The team will leave for Rajkot on Wednesday under the guidance of coach Keshab Bora of Tinisukia and team manager Lakkhi Ram Boro of Bhergaon. The Assam team will appear in the field for supremacy on November 18 against Lakkshadeep. It is worth mentioning here that Bhergaon area which always produced promising footballers had failed to offer them the requisite platform due to disturbances resulting from ethnic unrest and insurgency for a long time. However, with peace returning in the hard to access area since the last couple of years, these potentially promising young footballers have started making their presence felt in the national level soccer arena.